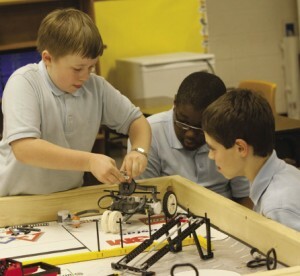 At Immaculate Conception School in Fayetteville, students can participate in a robotics program, where they work to resolve real-world engineering challenges by designing, building and programming LEGO-based autonomous robots. As part of the annual First LEGO League Challenge, IC students put their team-building and presentation skills to the test by competing against others from around the nation. The robots perform dozens of tasks in a set time, and the team presents a unique concept they have researched and developed. It is an exciting mix of science, math, programming, and creativity with skills to last a lifetime.